Writing a conclusion is the final step in the story process. A crucial part that brings the story to closure, wraps up events and leaves its reader with the final impression. It has taken a lot of hard work to get to this point so take the extra time and make sure that the ending does not disappoint. Memories,feelings, personal growth,hopes,wishes,a decision or defining action can be combined to make an effective story ending. See how the techniques above have been combined effectively to revise poor endings. So that is my story about how I got away from the pirate. When I close my eyes, I can still see the sneering face of the pirate. I felt so relieved when I was finally able to free myself from his evil hold. I knew from that day on, I would never take my boat out to that part of the lagoon again. So that was the end of my big skiing adventure. I’ll always remember my wild run down Devil’s Peak. I can still feel the wind whipping across my face as I raced down the mountain at breakneck speed. As I curl up by the fire, I hope that tonight’s storm will bring plenty of snow for tomorrow’s run. How to write a conclusion effectively. How to write an introduction. 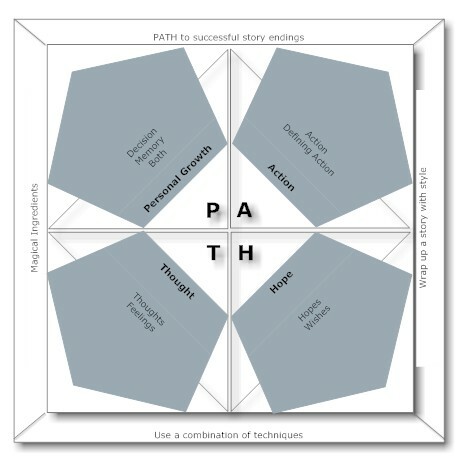 Download the PATH to successful story endings diagram. Return from writing a conclusion to the homepage.